Ok, so I get a new car and I decide to get a different set of pedals to try out in place of the OEM rubber pads that I so despise. Why not go with UUC or ACS like the last car? Well it's always good to try something new and the recommendation on most racer types lips has been OMP for some time. OMP Model 1010 in particular. I never really could motivate myself to swap the UUC's from the last car so having a new car presented the perfect opportunity and I simply could not resist. Now, if you worship at the altar of bling and you have spent significant funds on non-functional carbon fiber simply for the "cool" factor there really is no need to read further. You'll never get over the lack of a cool sticker or engraving and chances are you don't have a need for a set of pedals that allow you to actually drive the car harder and better than stock. 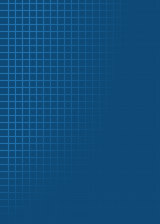 If on the other hand you want to optimize your controls read on. OMP's are rough cast aluminum and though they are available in a number of anodized colors attractive is really not their forte. The bright bolts really do not match the dull pedal surface and stick out like sore thumbs. These really do look like they belong in a race car and maybe not in a street going M3. The install is just as straight forward as the UUC/ACS types but requires less though bigger holes to be drilled in the car's pedals. So why am I so enamored with the damn things? Simple, they work far better than OEM or the ACS/UUC versions. What makes a pedal work you might ask, well working simply means accommodating the driver's needs to efficiently apply the car's controls in order to drive faster and smoother. To this end OMP's brake pedal is wider and longer this in turn brings it closer to the gas pedal and allows the driver to heel to toe far more efficiently than stock and stock sized replacements. The fact that they it is bigger than OEM allows individual users to select the correct height for their particular requirements and shoe sizes. I set mine about centered on the car's pedal and it is now far easier to roll the foot to heel to toe than with either stock or the UUC's I had before. 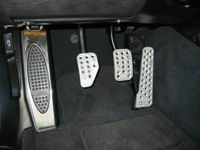 The clutch pedal is also designed with driving in mind - even though its larger, it is designed with an angled cut on the right side allowing for easy left foot access to the larger and easier to now reach brake pedal allowing the driver to utilize left foot braking far better than before. Another thing I found was that the raw aluminum surface actually provides far more grip that the ACS/UUC types with rubber strips protruding through aluminum plates. 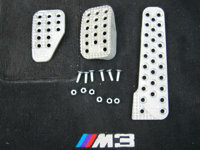 Even with wet shoes I found the OMP's to provide a far surer surface than either stock or UUC's. Function over form is the name of the game. Don't get me wrong, the OMP's are not ugly and outrageously out of place in the M but they do not look as good for a pure bling perspective as UUC/ACS, etc. They do however work much better. This is a pedal that a track guy or an autocrosser will love - others simply need to decide where their priorities lay. The kicker to the whole affair is that they only cost $45!!!!! ($50 for colors other than silver). My personal conclusion is simple - these are great, cheap, functional, and but do not carry the cool factor of some others so if you're worried about matching your pedals to the latest color of CF interior trim these may not be for you - if you however want pedals that allow you to get the utmost control out of your car and know or want to learn how to heel to toe and left foot brake these are great.